A new work by Michaelina Wautier (1604-1689) has surfaced. The work To Each His Fancy (elk zijn meug) turned up at an auction in Cologne where it was originally attributed to Jacob Van Oost. The painting has now been added to the exhibition Michaelina Wautier: Leading Lady of the Baroque, which includes almost all known works by Wautier and is the first solo exhibition dedicated to the artist. Update 26 June 2018: Katlijne Van der Stighelen, curator of the Michaelina Wautier exhibition, informed us that the attribution of the painting was more complex than what has been reported originally. In fact, the German auction house initially considered the painting to be ’17th-century Dutch School’ and sent an image of the painting to Fred Meijer. According to Meijer, the painting was not Dutch at all, but could be related to Jacob van Oost or Michaelina Wautier. Meijer suggested the auction house to contact Van der Stighelen. Thanks to his connoisseurship she was able to study the painting on short notice. A private collector presented the work ‘Elk zijn meug’ for sale at the Van Ham Auction House in Cologne. Because the house doubted whether the attribution of the work to Jacob Van Oost was accurate, they contacted curator and Michaelina expert Katlijne Van der Stighelen. She concluded that the work was not by the hand of Van Oost, but rather that of Michaelina Wautier on the basis of the strong stylistic similarities with her other works. 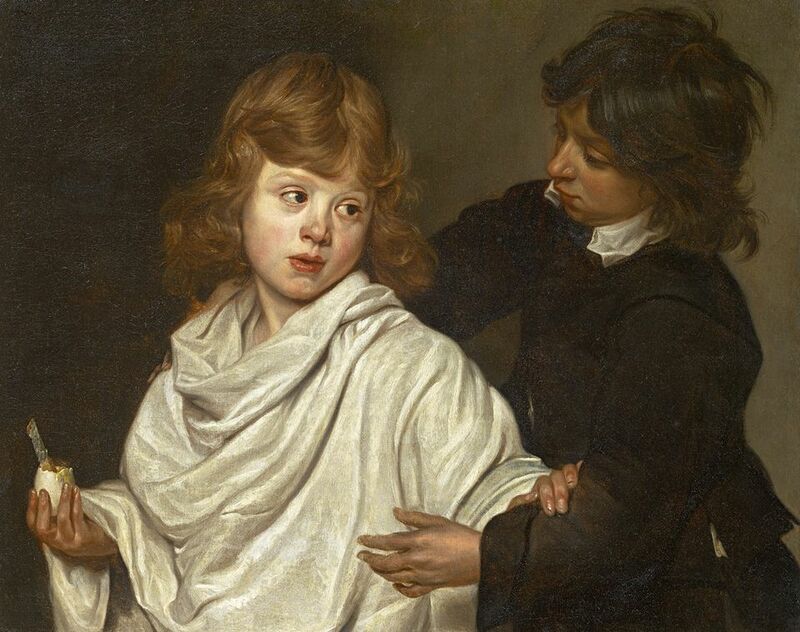 The recently discovered genre painting is 65 x 83 cm and portrays two young boys. The painting is an illustration of the saying, ‘Elk zijn meug’, or ‘Everyone to his taste’. The talent of Michaelina is prominently seen also in this new work: she switches apparently without effort between very subtle brushstrokes and powerful usage of color. ‘Elk zijn meug’ was purchased by the Phoebus Foundation on 17 May 2018. Beginning on 18 June, the work shall be added to the first exhibition of the work of Michaelina Wautier in the MAS. This exhibition is taking place in the context of the city-wide festival ‘Antwerp Baroque 2018. Rubens Inspires’.